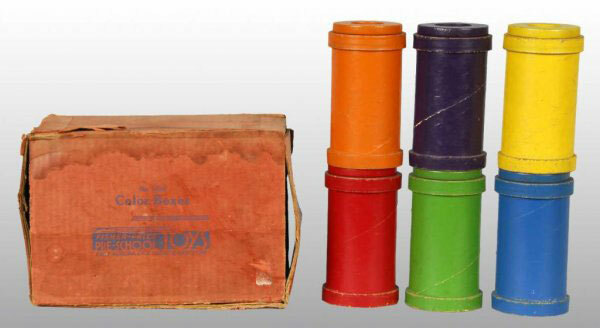 Description: The #1054 Color Boxes is a set of wooden cylinders with removable wooden lids. Each lid has a hole in the center to drop a wooden bead inside. The set was sold with 6 different colored cylinders, lids, and beads. FPT19044 - Round hollow blue wooden cylinder with a raised edge on both open ends. FPT19045 - Round blue wooden ring with a hole in the center and a recessed edge on one side. FPT19046 - Small round blue wooden bead. FPT19047 - Round hollow green wooden cylinder with a raised edge on both open ends. FPT19048 - Round green wooden ring with a hole in the center and a recessed edge on one side. FPT19049 - Small round green wooden bead. FPT19050 - Round hollow orange wooden cylinder with a raised edge on both open ends. FPT19051 - Round orange wooden ring with a hole in the center and a recessed edge on one side. FPT19052 - Small round orange wooden bead. FPT19053 - Round hollow red wooden cylinder with a raised edge on both open ends. FPT19054 - Round red wooden ring with a hole in the center and a recessed edge on one side. FPT19055 - Small round red wooden bead. FPT19056 - Round hollow purple wooden cylinder with a raised edge on both open ends. FPT19057 - Round purple wooden ring with a hole in the center and a recessed edge on one side. FPT19058 - Small round purple wooden bead. FPT19059 - Round hollow yellow wooden cylinder with a raised edge on both open ends. FPT19060 - Round yellow wooden ring with a hole in the center and a recessed edge on one side. FPT19061 - Small round yellow wooden bead.